The sauce was quite good, though. Especially after I added an orange to the mix. Make sure you get ruby grapefruits or you will be sad and your mouth will pucker up. So, while I love the idea of someone on Food Network cooking healthy and delicious food, I’ve not completely warmed up to her. I need to try a few more recipes before making a conclusion, I suppose. Preheat the oven to 350 degrees F. Season the salmon with salt and pepper, place on a rimmed baking sheet and roast until almost done, about 13-14 minutes. 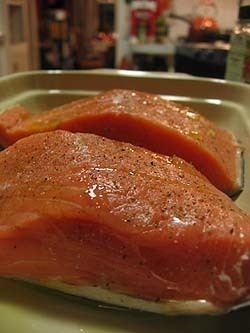 Turn on the broiler and finish cooking salmon for about 2-3 minutes, until there is a little color on the top. 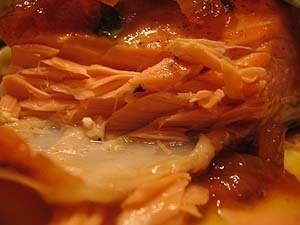 While the salmon is cooking prepare the sauce. Cut off the top and bottom of one of the grapefruits. Then standing it on end, cut down the skin to remove the pith and peel. Remove each segment of fruit from its casing and cut the segments in half. Set the segment pieces aside. Juice the other grapefruit and the orange and set the juice aside. It’s okay, you can co-mingle the juices. In a skillet, heat the oil over a medium heat. 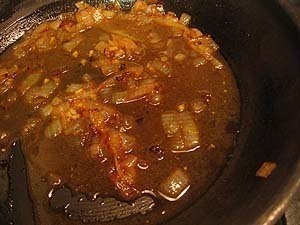 Add the shallot and saute until softened, about 2 minutes. 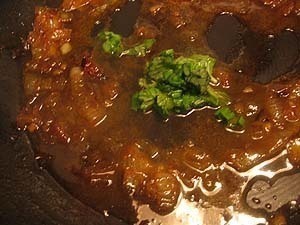 Add the ginger, juices, honey, and cayenne pepper and bring to simmer. Cook until sauce is reduced by about half about, 10 minutes. Add lemon juice and season with salt, to taste. Right before serving, toss the grapefruit pieces and basil into the sauce. Put the salmon onto a serving dish. 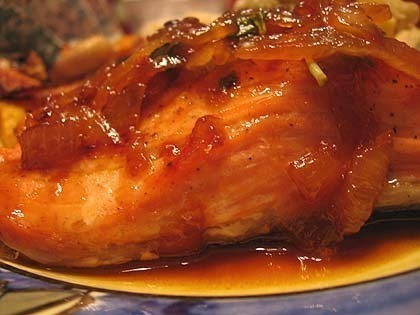 Spoon sauce over the salmon and serve. It looks quite pretty on the plate and it was tasty enough for a simple Friday night dinner. I also recently made a recipe with halibut that hopefully I’ll get up by Wednesday that I liked even more, though! Oh yeah and I made a fish chowder the other week. Hmmm, this may turn into a fish-only week of posts. That first picture makes my mouth water, and I just ate dinner! Do you think the sauce would be good with other kinds of fish? I hear what you say about Ms. Krieger. Interesting set of ingredients though. I would never have thought of pairing salmon and grapefruit. Now I will! I’ve seen Ellie Krieger’s show a couple of times but I’ve only cooked one of her recipes. I made her Thai-Style Halibut with Coconut-Curry Broth which I actually thought turned out pretty well. I substituted another white fish for the halibut and adjusted the seasoning a bit because I like things spicy, but overall it was pretty good. I love grapefruit so that shallot grapefruit sauce sounds yummy. Ooh, this looks yummy! I, too, am not sold on Ellie, if only because she looks like an eerily skinny version of Ina Garten, and her show has a similar look and photography style. Perhaps they are like Jekyll and Hyde? Anyway, I do love winter citrus, and maybe you could sear the salmon on one side instead of baking it the whole time? I mean, it wouldn’t be roast, but hey, it’s tasty. I made this for dinner tonight, serving the salmon atop a pile of spring greens from my CSA. The grapefruit sauce doubled as a salad dressing. The sauce was wonderful (next time I’m going to toss in a couple hunks of avocado) and the whole thing came together in under 30 minutes. Thanks for sharing this!